Situated on Lansdowne Plateau in Fairmount Park, the Centennial Exhibition is viewed here from a vantage point on George's Hill. 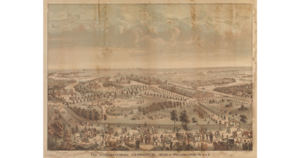 The International Exhibition of Arts, Manufactures and Products of the Soil and Mine, more simply known as "the Centennial," opened in Fairmount Park to great fanfare on May 10, 1876, and closed with equal flourish six months later. Modeled after the Crystal Palace Great Exhibition in London in 1851, and the first in a long line of major "world's fairs" in the United States, the Centennial exhibited national pride and belief in the importance of education and progress through industrial innovation. An additional mission of the Centennial grew from a desire to forgive and forget the Civil War. Philadelphia had precedent for such a fair. The Great Central Fair of 1864, one of many held throughout the Union during the Civil War, anticipated the combination of public, private, and commercial efforts that were necessary for the Centennial. The Great Central Fair, held on Logan Square, had a similar gothic appearance, the waving flags, the huge central hall, the “curiosities” and relics, handmade and industrial exhibits, and even a visit from the President and his family. The idea for presenting a World Exposition in Philadelphia honoring the hundredth anniversary of the Declaration of Independence was first presented to Mayor Morton McMichael (1807-79) in 1866 by Professor John Campbell of Wabash College, Indiana. Note: The above descriptive information came from the Philadelphia Encyclopedia. Local man purchases centennial clock, Waynesboro Record Herald, January 2, 2019. This page was last edited on 21 February 2019, at 11:29.